To go along with my previous post about book budgets, I decided to count up all the books I considered buying for the YA collection this year. I usually read the following book review magazines for YA reviews: School Library Journal, VOYA, Booklist, Publisher’s Weekly, and New York Times Book Review. But I also depend on the reviews that appear on my book vendor’s website which includes Kirkus Reviews (I use Ingram’s iPage). I find myself usually siding with what Kirkus and VOYA have to say. This list gives you an idea of how many books I’ve considered this year for YA. And most of these books have multiple reviews that I have to read and evaluate, including lots of books that have both rave reviews and horrible reviews. 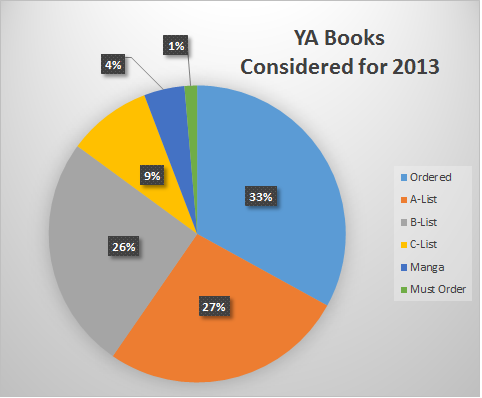 Wow, this puts into perspective how much work I did this year for collection development in YA. I read reviews for over 1,000 books, and with each books getting 2 or more reviews, that’s over 2,000 reviews that I’ve read this year. I’m exhausted looking at this number. It would be interesting to do this again for 2014 and compare. For those of you wondering how I get my numbers: for every book I consider, I add it to some kind of list, either MUST ORDER, A, B, or C-list. This helps me keep track of what I’ve already looked at so I’m not duplicating my work and looking at books several times. If I see it’s already on a list, I move on to the next book review. The book (or rather materials) budget has been stagnant at my library since I’ve been working here for the past two years. I definitely have seen the increase in books being published, even just from 2012 to 2013. I feel like I’m reading many more Young Adult book reviews than even and I find it hard to keep up as well as decide what to buy for our collection. It’s getting a little out of hand! Coffman thinks that we’re doing a disservice to our communities and our library brand by shrinking our book budgets, buying mainly popular titles that people want, and purchasing a high proportion of DVDs. I agree that DVD circulation will probably go down with the popularity of streaming services such as Netflix. (And we all know how scratched-up library DVDs get.) But it’s simply not possible or responsible to add more money to a book budget when there is no space to keep the books or no one interested in reading them. Keeping up a building is expensive. Paying staff is not cheap. 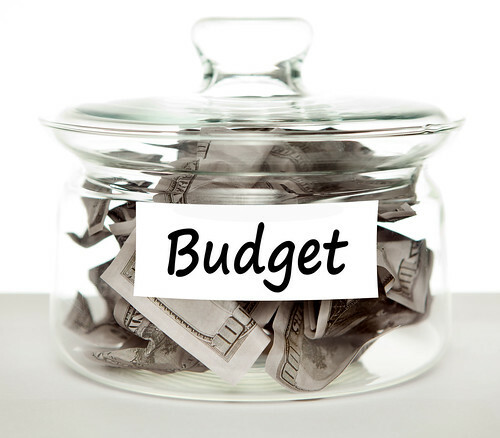 Buying and maintaining computer equipment takes a good amount of cash. Books are our brand but we can’t acquire everything. My thoughts exactly. Still, the book budget article brings up some interesting points. I just don’t know what the right answer is. 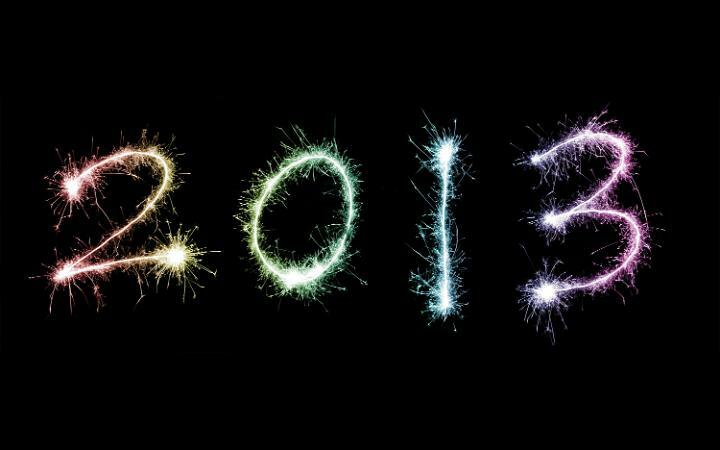 2013 is almost over. It’s been a great year at Abington Free Library. Here’s what I’m most proud of this year. The Teen Advisory Board at the library suggested that we start a book club this year. It’s been pretty popular so far. Every time we host a book club, the first 10 teens to sign up get a free copy of the book. These free copies were purchased with money donated by the Friends of Abington Libraries and I’m so grateful! April – Divergent by Veronica Roth – Most popular with 22 teens attending! We will continue the Teen Book Club in 2014. The first book of the year will be Clockwork Angel by Cassandra Clare. Click on the photo for more! People used to come to the public library to get service.